The Recipe: Decker’s late conversion on 3rd-and-7 - It's All Over, Fat Man! Happy Monday, friends. There was something subtle but important that happened in the Broncos-Giants game, and I held it out from YGS on Saturday so that we could look at it on its own, and ponder it. Facing a 3rd-and-7 with 3:49 remaining in a game they led 38-23, the Broncos threw the football. Not only that, they got the first down. In the playoff disaster last season, the Broncos faced a very similar situation (3rd-and-7 from the Denver 47, 2:00 to go, up 35-28), and were content to hand the ball off to Ronnie Hillman for no gain. The Broncos punted the ball, and three plays later, Jacoby Jones was in the end zone. At IAOFM, we’re big believers that possession is more important than time, and that it’s a worthy risk to throw the ball on 3rd-and-long, especially when Peyton Manning is the guy throwing the ball. What I’m going to do is show you the play, and we’ll think about why it worked. In this case, the Broncos are at the Giants 41-yard line, and they've just had runs by Montee Ball for zero and three yards against a heavily stacked Giants box. Institutionally, the Giants know John Fox well, and are counting on some Foxball. The Broncos come out in 12 personnel, with both WRs aligned wide with the numbers. Demaryius Thomas is at the bottom of the numbers on the offense’s right side, and Eric Decker is at the top of the numbers on the left. The Giants have eight men in the box, and the free safety is pretty close to the line of scrimmage, favoring the side that Thomas is on. On the wide side of the field, outside the hashmarks, there are only two players – Decker and cornerback Prince Amukamara. Decker is going to motion tight to the line, which the Broncos commonly do when they’re going to run the ball. In the above screenshot, you can see him starting to move that way. 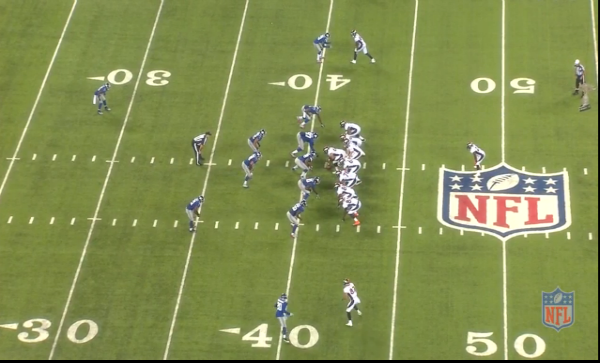 There’s a play fake, and Decker has a free inside release against outside leverage. 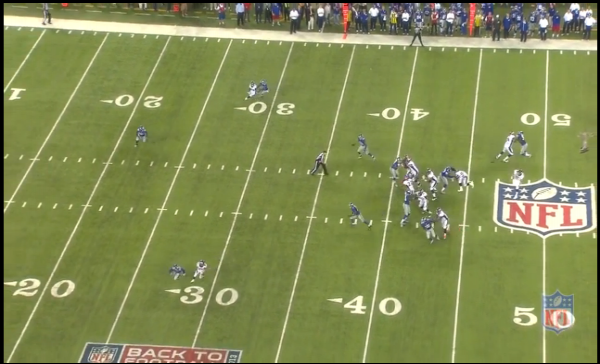 He runs the route like a skinny post, while closing down the cushion that Amukamara had given him. Amukamara reacts to the inside, knowing that he has no help. 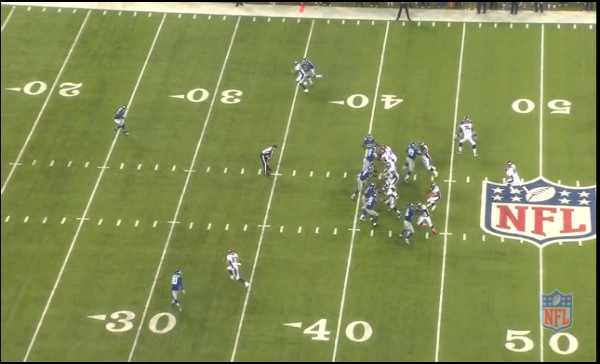 Decker breaks back to the outside, which turns Amukamara, and creates separation. Manning delivers a good throw, right on time, and the Broncos pick up the first down. Decker goes out of bounds, which is sub-optimal, but with a new set of downs, you can live with it. The Broncos are in run personnel. The extra TE tends to be a strong indicator for Denver that a run is likely. The Broncos have a strong tendency to run in this situation. Remember, the Giants know Foxball well. The Giants have struggled to stop the run, and have been physically beaten by the Broncos offensive line. This has led them to play eight in the box, with a ninth guy ready to fill quickly. Decker is a physical mismatch against Amukamara one-on-one. For all the draft hype around Prince a couple years ago, he been pretty average in the NFL when he’s been healthy. Decker is bigger and stronger, and he has a lot of field to work with, both inside and outside, on the double-move. The offensive line does a really nice job with protection. Look at how clean the pocket is for Manning. Peyton Manning is PMFM. He delivers the throw where it needs to be, when it needs to be there. Fox should learn to trust him in this situation. Fox saw it work, and is willing to try it more often. Defensive coordinators saw it work, and they’re less willing to commit to stacking the box. Lack of commitment by the defense leads to Manning being able to pick the best play, and have it be most successful. That is, when Fox really wants to run, this can help make that easier. We can only hope that both effects come to pass. That’s all I have, friends. Here’s to having the balls to go for it, and here’s to putting up a fifty-burger on the Raiders tonight. TJ reacts to the Broncos' 34-17 victory over the Ravens in Week 15 of the 2012 season. Thanks to bold decision-making, or a one-point deficit, Matt Ryan led the Falcons to a comeback win that John Fox didn't think Peyton Manning could pull off. Love this. Thanks, Ted! I´m really becoming hopeful that Foxball as we knew it is dead. Twice in the last two games this kind of decision is a good sign. Chris is speaking my language right here. Sorry, Ted, but I ordered the sixty-burger. I'm sending the fifty-burger back. Fox either saw that OR Manning decided to throw on his own. My bet is the latter he saw the 8 strong in the box and knew he could make the play. Is it kickoff time yet?